Rob is an analytical chemist with over 40 years experience in the application and marketing of atomic and mass spec instrumental techniques. His expertise is founded on 24 years’ experience working for an ICP-MS vendor and 17 years as principle of his own consulting company, Scientific Solutions. He has authored over 90 publications and written 4 textbooks. 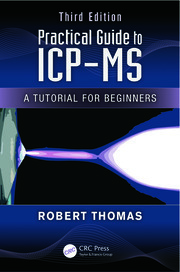 Robert Thomas has worked in the field of trace element analysis for over 40 year….24 years for a manufacturer of ICP-MS instrumentation, and 16 years as principal of his own consulting company. He has served on the American Chemical Society (ACS) Reagent Chemical Committee for the past 16 years where he has worked closely with the United States Pharmacopeia (USP) to align the testing procedures for elemental impurities in reagent chemicals with those of pharmaceutical materials. He has authored over 90 publications on trace element analysis and written four textbooks on the fundamental principles and real-world applications of ICP-MS. His most recent book is entitled “Measuring Elemental Impurities in Pharmaceuticals; A Practical Guide.” He has a graduate degree in Analytical Chemistry from the University of Wales in the UK and is a Fellow of the Royal Society of Chemistry (FRSC), and a Chartered Chemist (CChem).